Cite examples of India’s contributions to the Silk Road. Describe how religions in general, and Buddhism in particular, spread along the Silk Road. Identify ingredients and practice tasting the results of the recipe. Name ideas, goods, and foods from India that were traded along the Silk Road. Identify Buddhism as a religion that spread from India to China along the Silk Road and describe how the local culture and geography of each place impacted the depictions of Buddha. Measure, toast, grind, and combine spices for the Vegetable Curry and taste and season the dish according to their preferences. Copy the Curry Spice Mix recipe to hand out. Copy the Vegetable Curry recipe to hand out. Welcome students and introduce the lesson for the day. Today we will be making vegetable curry and learning about India's contributions to the Silk Road. We will be traveling to the city of Kashgar, an oasis town on the western edge of the Taklimakan Desert. Though Kashgar isn't technically in India, it was a central meeting place for the three main regions of the Silk Road: China, India, and Rome. Many of the items that were traded from India along the Silk Road passed through Kashgar, including a variety of religions that spread along the Silk Road. During the time of the Silk Road, Kashgar was one of, if not the greatest market city in the world. Imagine arriving from a months-long journey through deserts, over mountains, and across treacherous terrain to a city bustling with activity. At its peak, caravans of more than a thousand camels or yaks arrived each day carrying silk, spices, gold, gemstones, and people from every part of the world. There was no greater mixing pot of people and cultures than Kashgar. Walking through the streets, you would see goods from all over the world and hear more languages spoken than any other place on Earth at the time. Prompt students to imagine they are walking through a Kashgar market. Ask them to recall goods traded from China along the Silk Road. What are some of the things they might see being traded from China? What about from India? Encourage students to use the visual aid to do some "research." Explain that with such a diverse mix of people, much more than goods were traded—new ideas also proliferated along the Silk Road. 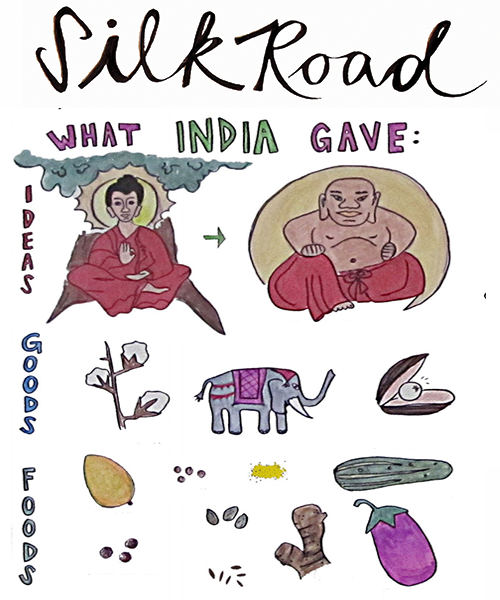 Ask students to use the visual aid to give an example of a big idea that came from India: Buddhism. Explain that many religions spread along the Silk Road (including Zoroastrianism, Manichaeism, Buddhism, and, later, Christianity and Islam). This was partly because of the diversity of people who traveled the road. At a time when most people lived their entire lives within the same small village or town, people with new ideas were often drawn to Silk Road trade routes or cities like Kashgar where they were less likely to face persecution for being different. The Silk Road also offered an ideal place for missionaries to make a living. Travelers along the often-treacherous routes (the land just outside Kashgar towards China was known as the "Trail of Bones" because so many travelers lost their lives there) were well known to take out “insurance” against whatever misfortune might befall them by donating to whatever religious person or group they might encounter. Buddhists especially proliferated along the Silk Road, where the fact that they were willing to live isolated and simple lives allowed them to be happy living with less. They set up temples and way houses where many travelers stayed the night in return for a small payment, and often left with a new religion. As religions spread, they often changed according to the unique cultures of the people that practiced them. This is reflected in the difference in appearance between the Indian and Chinese buddhas. What differences do you notice between these two buddha depictions? The Indian buddha represents Siddhartha, the rich young prince who renounced his birthright as ruler to travel throughout India on the search for enlightenment. On his journey, he almost starved to death before encountering "the middle road," a way of living that involved neither deprivation or excess. The Chinese buddha is one of many Chinese buddha depictions, and likely is modeled after a fat, friendly zen monk or healer that traveled the Chinese countryside in 950 AD helping people. Today we are making vegetable curry. This food is another example of something that spread throughout Asia during this time but was greatly influenced by the local cultures of the places that adopted it. There are different types of curry all over Asia that use different combinations of spices. Today we are making a version of curry representative of one that might be made in southern India, with coconut, mustard seeds, and curry leaves. Small-group check-in: What item would you want to trade for from India? Review the recipe and explain that (just like with the Autumn Harvest Soup lesson), today we'll be using the concept of cooking rates to decide what order our ingredients get added to the curry as we cook. We'll start with the "aromatics" or "flavor base"—in this case our masala paste—then add the crunchy vegetables, and then the leafy ones. Students reflect on the day's recipe. If there is time, ask students to brainstorm foods that are found in many places in the world but vary according to local culture or ingredients. "Spiced" vs. "Spicy": When they learn we're cooking with spices, some students are nervous that the curry will be too spicy for them. We're careful to make the distinction between a dish that is highly "spiced" and one that is "spicy." This is not a spicy curry. Masala paste: The ground-up blend of curry powder, garlic, and ginger is called "masala paste" and serves as the flavor base for this recipe. Preparing the ingredients this way is fun (students love to use the mortar and pestle) and helps to intensify the curry flavor. If you're in a rush or don't have a mortar and pestle, you may mince the garlic and ginger and skip grinding them together with the dry spices—just add them all to the pot when you would the masala paste. Curry leaves: Curry leaves are the aromatic leaves of the curry tree, native to subtropical areas of India and South Asia. They are optional in this recipe, but highly recommended if you can find them. They freeze well and may be used directly out of the freezer as if they are fresh. Kohlrabi: We used kohlrabi when we taught this lesson and students loved it! They were very excited to try a novel vegetable. We often described it as like a cross between an apple and a broccoli stem, which tended to promote buy-in. Paying it Forward: Each class uses curry powder made by previous classes to prepare their curry and makes a batch of fresh curry powder for the following class in this lesson. We do this because it helps to streamline the process time-wise. We always share this information at the beginning of class so that students are prepared to part with the curry powder that they personally grind. Curry powder: We make our own curry powder from scratch because it is fun (students love using the mortar and pestle to grind the spices) and results in a more vibrant flavor. This recipe is also delicious with store-bought curry powder. We tell our students this because many of them may not have access to a wide variety of spices at home. Toasting the spices: Toast the spices just until the mustard seeds begin to pop and the cumin seeds begin to get darker. Be careful not to toast too long to avoid an acrid, or burnt, taste. Grinding the spices: It is easier to grind the whole spices to a fine powder if you wait until after the wholes spices are fully ground to add the turmeric and chile flakes to the mortar and pestle. Making extra curry powder: Our curry powder recipe makes more than enough for students to take the extra home in small envelopes. We like to do this because many students may not have access to a wide variety of spices at home. Other uses for curry powder: This curry powder is delicious on popcorn, roasted nuts and seeds, or roasted vegetables. Preventing burning: This curry tastes best when the masala paste has been thoroughly fried in oil. That makes this lesson an excellent opportunity to show students how to deglaze the pan with water to scrape up bits of flavor that get stuck to the bottom and prevent burning. "No thank you” portions: Some of our students were hesitant about trying this recipe because it was unfamiliar to them and highly flavored. We always serve them very small "no thank you” portions so that they have the opportunity to take a small taste if they want to. Almost without fail, every student that tried a small taste came back for a full serving.